Brightfield microscopy uses light from the lamp source under the specimen gathered in the condenser, and then shaped into a cone where the apex is focused on the plane of the specimen. In order to view a specimen in a brightfield microscope, the light rays that pass through it must be changed enough to be able to interfere with each other (contrast) and therefore, build an image. At times, a specimen will have a refractive index very similar to the surrounding medium between the microscope stage and the objective lens. When this happens, the image can not be seen. To visualize these biological materials well, they must have a contrast caused by the proper refractive indices, or be artificially stained. Since staining can occasionally kill specimens, at times darkfield microscopy is used instead. 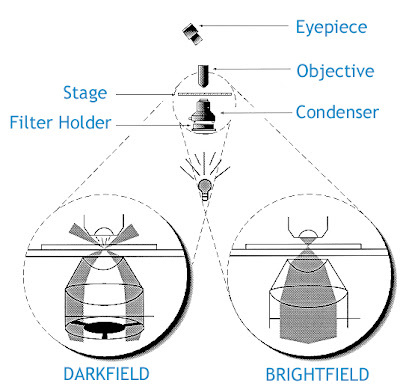 While brightfield microscopy illuminates the sample with a filled cone of light, in darkfield microscope the condenser is designed to form a hollow cone of light. The objective lens sits in the dark hollow of this cone and light travels around the objective lens, but does not enter it. The entire field of view appears dark when there is no sample on the microscope stage. However, when a sample is on the stage the sample appears bright against a dark background. It is similar to back-lighting an object in order to make it stand out. Illustration courtesy of Washington State University. 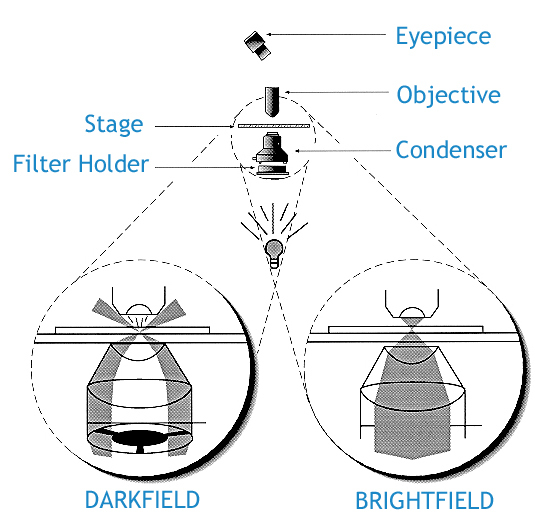 The illustration above shows how the light is directed differently when using a darkfield microscope or a brightfield microscope. There are several different types of darkfield microscopes, including stereo darkfield microscopes, darkfield biological microscopes and darkfield metallurgical microscopes. Darkfield is commonly used to better view bacteria, blood cells, diamonds and precious stones, and various types of algae. You can learn more about darkfield microscopy and view different darkfield microscopes here.